217 pages | 93 B/W Illus. In recent years, there have been significant developments in detector technologies in the field of astrophysics, requiring lower temperatures with simple self-contained refrigerators. Temperatures in the range of 1K to 50mK are now achieved by using dedicated closed-cycle miniature sorption coolers. This book presents the theoretical and experimental knowledge necessary to design and build your own miniature refrigerators, including both single shot and continuous 1 K, 300 mK and 100 mK coolers, and details how to write the needed design software. 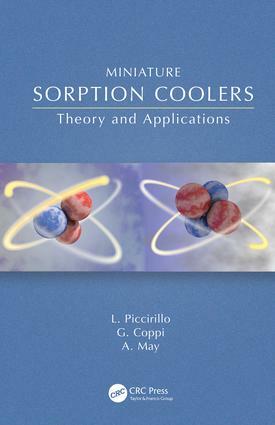 This text will be of interest to students and researchers, already familiar with basic physics and thermodynamics, who want to understand how sorption coolers and miniature dilution refrigerators work. Lucio Piccirillo is a Professor of Radio Astronomy Technology at the University of Manchester, UK, with extensive experience in designing and building cryogenic systems primarily used to cool astrophysical detectors. He has written more than 100 publications in international journals. Gabriele Coppi and Andrew May are PhD students working under the supervision of Prof. Piccirillo.